Space requirements- 2 students per table. The bent nib has amazing possibilities! For a weekend workshop, participants will explore tools and techniques that created distinctive lettering styles and characteristics of commercial letterers in the 1920s and 30s. Using pen nibs developed with square, round and oval shaped points as well as our familiar broad edged tools, we will translate the traditional techniques of calligraphy and adapt them to lettering of all types, from elegant monoline scripts and italics to blunt-edged and playful roman forms. We’ll look at the construction of characteristic early 20’s drawn alphabets and bold faced display lettering using multiple strokes. For participants in the longer sessions (3 to 5 days) we will use these nibs to create contemporary and inventive letterforms. By using pen lifts and pen manipulation, participants can create a number of unique effects including scripts that mock brush lettering, give unique effects, and create both bold and delicate abstract forms. Participants should come away from this workshop with the ability to add to their repertoire new lettering techniques, vintage styles and new lettering styles that are accomplished with a variety of historical tools. Space requirements- one table per student (or 2 students per 8′ table). A fabulous journal to work on, we will use as our grounds the 11 X 16 Mahara watercolor journal (optional), heavy watercolor papers, primed and unprimed canvas. Using these grounds we will explore the textural appearance of writing systems, primarily non western and non recognizable to the traditional western sensibility. Each participant will choose an alphabet that they don’t recognize which could be ancient, archaic or modern. An analysis of the forms of the writing system will follow along with experimentation using a variety of tools in order to give letterforms a personality of their own. Some of these results will be legible words or text, and other results can be representations of letterform that may or may not be legible. Experimentation and invention are the key words here and the intent will be to develop the calligraphic marks based on the personality of the participant. A variety of surfaces or grounds can be explored, including heavy papers and canvas. Because many of the techniques for texture can translate to either, students can work on both. Participants may work in a large journal (optional), creating textures from early experimental letterforms as the class progresses, and others will be able to focus more primarily on loose sheets of paper or on canvas as a ground. Techniques using acrylic paints and mediums to prepare these surfaces and achieve texture and painterly effects will be explored. Space requirements- 2 students per 6′ table. NOTE: This is an excellent workshop to add on before the “Layered Journal: Text and Texture” below to give your participants options to attend one, two or three days of study. Students can work in the journal and then use the work for texture in the journal class. The goal of this course is to use the artist’s eye to identify the basic shapes, texture and characteristics of a specific style of lettering. With essential information about the construction of individual letters using calligraphic tools, this class will begin with the broad edged pen and work towards identifying the underlying shapes of individual letters. We will then move to class discussions, looking at the characteristics of various historical letterforms to analyze the size, shape, weight, direction and overall texture of the chosen text. We will then analyze the specific internal characteristics of each lettering style in comparison to other letterforms. As we go through each style, students will use these analytic principles to write the basic strokes of that form before moving on to the next one. This workshop is designed to give the beginner basic principles to facilitate learning any style of lettering they come across. For the experienced or intermediate lettering artist, it is the opportunity to fine tune letterforms they already know as well as tools to facilitate the innovation and invention of their own lettering style by using the basic principles of analysis and applying them to new work. For a beginning or beginning/intermediate student, this workshop will work with the analysis, structure and mechanics of a formal calligraphic hand. We will also delve into the history and evolution of the chosen letterform, creating historical context for the style of writing and working with techniques and tools to modernize the hand to suit our own time, style and needs. Lettering styles to choose from include Italic, Textura or Blackletter, Uncial, Lively Roman caps, formal lower case Roman, Bastarda, Foundational, Carolingian, Humanist, Versals, and drawn letters. This class will explore the theory and practice of creating artwork with a spiritual foundation. Using imagery combined with text, participants will learn a painterly approach to reach a goal of visually articulating a thought or theme into a painting or series of paintings. This class will present a simplified theme for calligraphic paintings, born out of a combination of Randall’s complex, multiple-text Paintings that Inspire Conversation, a traditional approach for an illuminated manuscript, icon paintings, and the theory and practice of poster art. Participants will choose their own text, associated imagery, and style. The symbols associated with the spiritual focus being interpreted will have a strong visual influence in the creation of the artwork. These symbols and intent of the artist will then be discussed, and both modern and historical interpretations will be used as examples to provide inspiration. The goal is to create a visual representation of the theology or belief system of the artist, while creating a contemporary piece of artwork that has its roots in an ancient tradition. Participants should be prepared for lively and deep discussions that will be used to create a foundation for the artwork and that allows other participants to gain understanding of the process of working out layout, composition and symbolism for a finished work of art. This class will explore the theory and practice of creating theme-based artwork with text as a major element. Using imagery combined with text, participants will learn a painterly approach to reach a goal of visually articulating a thought or theme into a painting or series of paintings, born out of a combination of Randall’s complex, multiple-text Paintings that Inspire Conversation. Participants will choose their own text, associated imagery, and style. The use of symbols and intent of the artist will be discussed. The goal is to create a visual representation of the theme of the artist in a contemporary piece of artwork. Participants should be prepared for lively and deep discussions that will be used to create a foundation for the artwork and that allows other participants to gain understanding of the process of working out layout, composition and symbolism for a finished work of art. Space requirements- one table per student or 2 students per 8′ table. A fabulous journal to work on, we will use as our ground the 11” X 16” Nujabi Taj Mahal watercolor book, heavy watercolor papers, primed and un-primed canvas. The goal of this class is to experiment with acrylic paints and mediums to achieve textural effects. These techniques can cross over on both heavy watercolor papers and canvas. We will use a variety of media (including Sumi, walnut and acrylic inks, acrylic paint, acrylic mediums, and permanent markers) to achieve coloration and textural effects. For watercolorists, this journal has large enough pages to paint watercolor vignettes to create a travel-style journal. Mostly abstractions, we will move from page to page to create a cohesive and progressive composition. We will discuss the reasons behind the design decisions, color choices, and textural effects and how they relate to the text(s) or subject matter. We will also explore working with primed canvas. This ground gives the artist the ability to layer lettering, achieve staining effects, experiment with color layering and texture to achieve a depth within the artwork that is difficult to achieve on paper. This portion of the workshop will encompass the preparation of unprimed canvas and testing different textures from rough to smooth. As with the heavy papers, we will experiment with a variety of media (including gel mediums, acrylic paint, acrylic ink, and colored pencil) to achieve coloration and textural effects, and discuss the uses of medium and how they would apply to one substrate or another. In a more specifically focused workshop, participants are invited to explore the versatility of working on artist’s canvas. This ground gives the artist the ability to layer lettering, achieve staining effects, experiment with color layering and texture to achieve a depth within the artwork that is difficult to achieve on paper. This workshop will encompass the preparation of unprimed canvas and testing different textures from rough to smooth. We will also work with primed canvas and explore painting techniques to incorporate with our calligraphy. We will experiment with a variety of media (including a selection of acrylic mediums, acrylic paint and acrylic ink) to achieve coloration and textural effects, and discuss the uses of differing mediums and how they would apply to achieve a variety of textural effects. The workshop teaches a calligraphic hand and the principles of medieval page design with techniques for illumination of letters and decoration. Beginning with a look at traditional examples of two illuminated manuscript styles,students will choose one example to study for the workshop. Working with traditional tools, we will commence a study of the chosen letterform and work with the lettering itself to understand and refine forms as the week progresses. An overview of the characteristics of this hand will be discussed including an analysis of form, shape, rhythm of writing and the texture of the text on the page as well as historical context and the evolution of the letter form. As the week progresses, we will discuss the techniques for layout and design of the page and the incorporation of illuminations. Canons of page construction and the design of illuminated letters and decorations will end the week to tie both calligraphy and illumination together. A one day course with a focus on the materials and techniques for using acrylic paints, inks, mediums, gels and pastes. 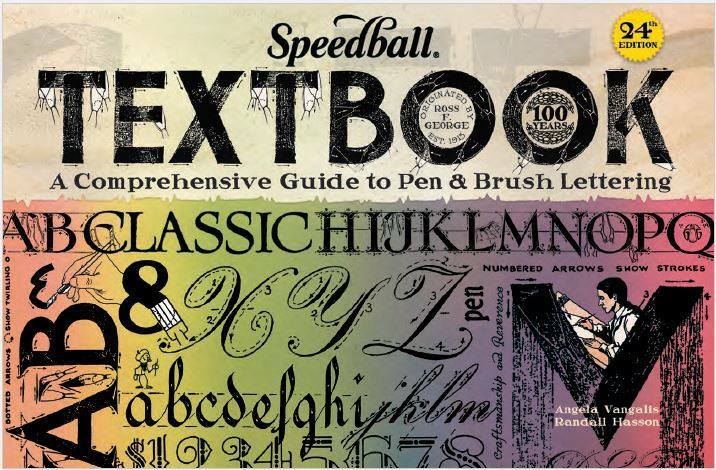 Using one of the most versatile and durable mediums available today, we will concentrate on techniques for adapting calligraphy to a variety of textures and surfaces. This session will give detailed information with the goal of understanding the materials we paint with and why they perform in certain ways on canvas and heavy papers. Calligraphers will be introduced to techniques that will allow them to create layers using marks and letterforms in traditional and non-traditional ways. Participants should expect a wealth of information and are encouraged to take detailed notes. e artist, while creating a contemporary piece of artwork that has its roots in an ancient tradition. Participants should be prepared for lively and deep discussions that will be used to create a foundation for the artwork and that allows other participants to gain understanding of the process of working out layout, composition and symbolism for a finished work of art. For the one day course, we will focus on the materials and techniques for using acrylic paints, inks, mediums, gels and pastes. Using one of the most versatile and durable mediums available today, we will concentrate on techniques for creating a variety of textures and surfaces. This session will give detailed information with the goal of understanding the materials we paint with and why they perform in certain ways on canvas and heavy papers. The two day course builds on the first day as we move into layering and glazing techniques and add a more diverse array of specialty acrylic paints, gels and pastes as grounds. Participants should expect a wealth of information and are encouraged to take detailed notes. Masters of the past achieved luminous effects in coloration with thin transparent glazes. Learn how Acrylics can help a painter achieve this level of depth without the use of solvents or thinners. Acrylic paint, mediums and gels have evolved into one of the most versatile and durable painting options for artists today. Compare the difference between traditional and modern pigments and when to use them for transparency or translucency. Learn how to control drying times. Use techniques for watercolor-like washes and understand how to unify the surface of a painting. Acrylics allow you to adjust your painting to suit your own personal goals and define your personal style. Space requirements- 2 students per 6′ or 8’table. Beginning with essential information about both traditional and modern pigments, this workshop will explore the applications of each. Many new organic pigments have been introduced into the artist’s palette in the last 20 years and offer an entirely new way to see color. We will move from color theory to pigment reality. Participants will gain understanding of how to mix clean colors, how to glaze with transparency or translucency, which products build up textures, and the use of impasto techniques. Learn how and why each technique can affect the final appearance of color. Though Acrylics are the medium of study, the information can be applied to oil, watercolor, and other wet media.